Chicago Bicycle Accident Lawyer | Illinois Bicycle Lawyers at Keating Law Offices: Can You Bike With Headphones in Illinois? Can You Bike With Headphones in Illinois? Last week, Josh Levin, the Senior Editor at Slate Magazine called me regarding an article he was writing about bike riding while wearing headphones. Josh had a very simple question: Is it legal to ride one's bicycle in Illinois while wearing headphones? The answer to that simple question, however, is complex and can only be answered as follows: Technically you can legally ride your bike in Illinois while wearing headphones, but you shouldn't. Here's why I give such a convoluted answer to a seemingly simple questions. Section 12-610 of the Illinois Vehicle Code clearly states that the driver of a motor vehicle may not wear headset receivers while driving. The plain language of the statute, therefore, only addresses the driver of a motor vehicle and it does not pertain to a bicyclist. There may be an argument that since a bicycle has the duty to adhere to all rules of the road that this statute of headphones also applies, but the statutory construction of this law is very clear. If the legislature wanted the law to also address bicycles then they would have/should have included bicycles. The legislature didn't so a fair interpretation is that the intention was only to address operators of motor vehicles. 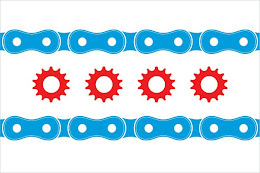 Nonetheless, the Illinois Department of Transportation has published a "Safe Bicycling in Illinois" booklet that is conveniently available online in PDF form. Page 14 of the booklet offers the simple advice for Headphones: "Don't wear them! As a bicyclist in traffic, you can hear more of what's going on around you than motorists can. In fact, people you share the road with expect you to hear their engines, horns, or shouted warnings. If you wear headphones you might not hear something that can help you avoid a crash." IDOT's publication doesn't have the force of law, but it does reflect that the state recognizes the risk that comes with riding while listening to headphones. I completely agree with IDOT's position. As not only an attorney that represents victims of bicycle accidents, but also a regular bicyclist, I know the importance of having all of your senses attuned to your surroundings. It's always nice to listen to some music or news, but when riding your bike it's better to leave the headphones off and focus on your ride. The risk of getting into a bicycle accident because you were listening to your headphones is not worth the minor reward of some extra entertainment.